Can you help by giving something back? You may have heard in the news recently that many grammar schools could be badly affected by the proposed changes to the National Funding Formula. Unfortunately, and in common with many other North Yorkshire Secondary schools, Ermysted’s is likely see another sharp decline in funding this year. The Old Boys’ Society has decided to do all we can to continue our long trend of supporting Ermysted’s. In the past our fundraising has helped with major building projects and equipment, as well as paying for items such as sports kit for school teams. The cost of funding the sports teams at Ermysted’s is around £15,000 per year. This includes paying for transport, pitch expenses etc. The continuing cuts in funding mean that these integral features of school life, which we took for granted when we were pupils, are increasingly under threat. 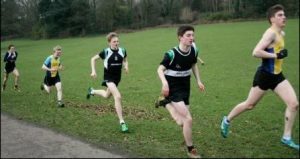 That’s why we’re launching the Ermysted’s Support Fund – an ongoing fundraising appeal to help ensure our school continues many of its long traditions in sporting excellence. Please give what you can. You can make an online donation or regular payment via Paypal on our Donations page. 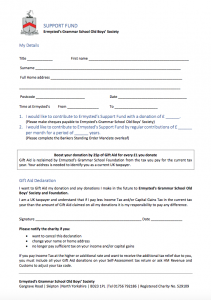 If you’re able to give a regular amount by annual or monthly direct debit, please click here to download a direct debit form to fill in and return to us by post. Once completed, please return your form to: Ken Oxley, Ermysted’s Grammar School, Gargrave Road, Skipton, North Yorkshire BD23 1PL. Thank you very much for your support. We hope that with your support, we can help enable Ermysted’s to give the current and future generations the chance to experience and gain from activities not included in the standard curriculum.